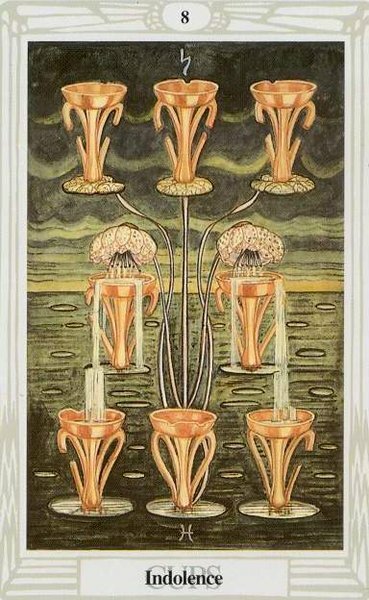 I thought this month I would explore one of the more positive cards in the Thoth deck – here we have the 2 cups – entitled Love. A card people want to see in regards to relationship matters as it is a card of balanced and even love. A relationship that can last that has both partners as equals supporting each other but standing on their own two feet too. As we look at the image we see two fish entwined and feeding energy in the form of light into the lotus of spiritual love they are standing on – this shows them as separate yet also each has an equal footing in the relationship that is balanced. The fish symbolises love and Crowley talks about them being dolphins though clearly they do not resemble dolphins in their depiction on the card. Dolphins are creatures of love, often associated with spiritual love and giving, fish in general are connected with water and thus the emotions. Here they are in balance and feed into the central stricture as a well as acting as a bouncing point for spiritual love from higher sources to bounce from and on out to the wider world. In the way you often see when you are in love the whole world around you seems a better place and it is easier to love all people as you are feeling filled with love yourself. Being a ‘2’ card it is a card that has just differentiated from the unity of spirit into two things so the driving force is to return to that union, so in relationship we seek to unite with our lover and become one again, yet there is also the tension of being in the physical world and complete union through all time is difficult or impossible to achieve physically though our souls may experience the union fairly fully. The background is yellow calm sea becoming green in the foreground indicating a sense of positive self-regard and self-esteem (the yellow) is the source of the love (green) and this relationship is founded in the self-love that each person has of themselves – we can not fully love another until we love ourselves. In some cases it may well be that each person has indeed fallen in love with a reflection of themselves in the other person – something they may not yet have seen in themselves. Snuffin talks about the symbolism of the dolphins being additionally connected to the sun and the moon – with each fish a different eye colour – the one on the left has a yellow eye representing the sun and the one on the right a silver eye representing the moon. 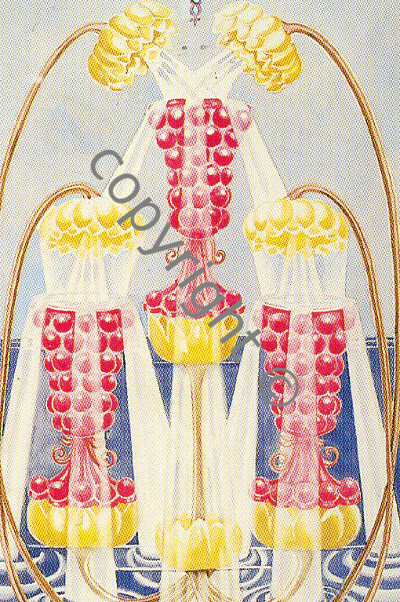 In addition there is a tenuous link with the Emperor and Empress with the 5 and 4 fins on the inner side of each dolphin, and these cards being the 5th and 4th trumps (fool = 0) personally I do feel this is tenuous – though in an intuitive sense makes for a good connection between the two poles of energy each of us has – the masculine and feminine. As we integrate these so we are better able to be whole in our relationships with others and make for better, more harmonious and loving interactions. So in this sense it is a useful trigger point in a reading. With the astrology being Venus in Cancer and this is harmonious in itself we have additional links with beauty, the home and a feeling of emotional stability, love and protection. 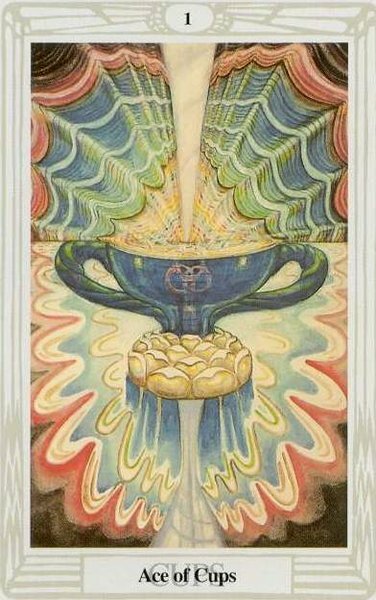 This months Thoth Tip focuses on 8 Cups, keyword – Indolence – I picked this card from the deck with the intention that it would be the card that would be of most use to those reading this months tips – either because of something they found confusing about reading the card or that something in the message of this card would be pertinent to them now. So this card is for you. This card, with its dark background and empty cups, shows a picture of stagnation, where there is very little left to give. In psychological terms it is a card that often appears when we are complete exhausted and burnt out. It might br through over work and trying too hard, or it might be a relationship is taking all our energy and we are keeping none for ourself. Either way the root of this situation is usually that we haven’t valued ourselves enough to say no to what is taking our energy. We in some way fear that if we say no it either makes us a failure, or a bad person, or we won’t be loved. Actually we fear being loved, accepting love from others and being supported. It might be we feel if we were we would ‘owe’ too much back, we wouldn’t be able to repay a kindness etc. Or it may be that we are used to being treated badly and to be treated well would challenge our early beliefs about the world and about ourselves. This can be a frightening prospect. 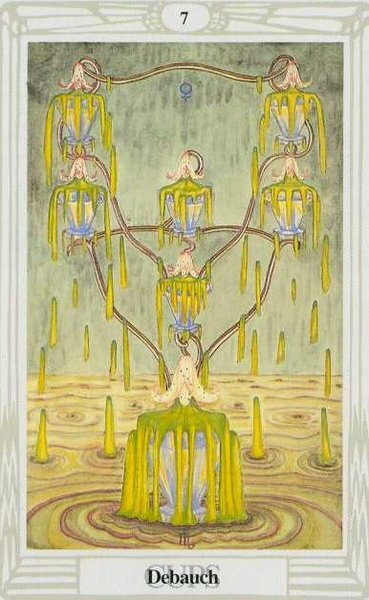 However the appearance of this card in a spread very often means it is exactly the right time to be facing these issues and in many cases it begins with saying “No”. No to extra work, no to a friend, family or partner who wants more from us, and a “Yes” to ourselves. It may just be we need a break to recover, it may be we need to make some lasting changes, but it all will start to improve as we say no. As this is the underlying feel for this card it can also manifest in the physical world as an illness, colds and flu serve to force rest on us we need, and help us say no and take the space from those who have been making demands on us. We can prevent this happening if we take action to say no ourselves, or sometimes we can allow this to happen and be compassionate to ourselves and realise our body has given us what we really needed to further our growth. The keyword “indolence” is defined in the dictionary as : habitually idle or lazy, indisposed to exertion or labour. So how does this rather harsh word fit in here? When we are exhausted we are actually too tired to work much further and further exertion can see our work with error and slips that can appear as being ‘lazy’ with the quality of our work. But I feel a stronger feel for this word is in the situation where we have actually known we are giving too much, we are over doing it, we are just not looking after ourselves, but despite the warning signs we have chosen to ignore them. In a sense the hard ‘work’ here is to face the truth and to set the limits we need to set for ourselves. Sometimes being lazy in our lives is actually working very hard and against our own best interests as the energy and will to create conflict with our bosses and loved ones feels too much to do. So in this sense we can be seen as indolent. Lazy in not setting our boundaries with others, hoping someone else will notice our hard work and tell us to take time off, and do the work of being responsible for us. Still quite a hard-hitting message, however if we realise it is not in our working too little that we are lazy, but in our attention to what is best for us, our whole being, that we are lazy. We can address the situation and turn it around. Take some time off rest and recuperate and plan for a lifestyle change if one is necessary.